Identification: Eurytemora affinis is around 1.2–1.3 mm in length (Torke 2001); females 1.1–1.5 mm, males 1.0–1.5 mm. 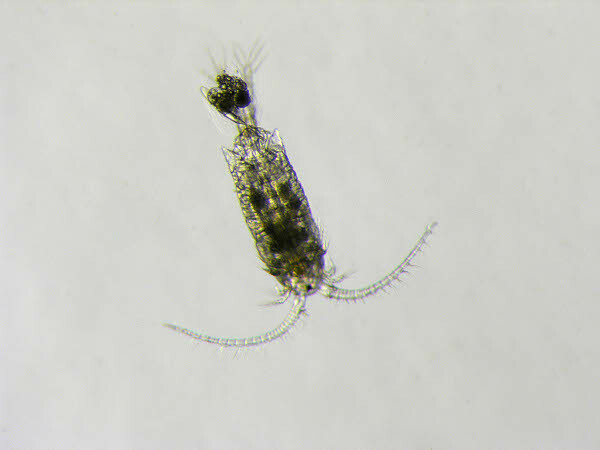 This copepod exhibits a caudal ramus that is more than 3 times as long as wide and has 5 obvious setae. When viewed laterally, the maxillipeds are shorter than the width of the body. Females have a 5th leg and the 5th leg has no endopods. Adult females exhibit lateral processes, one on each side of the genital region and the metasomal wings. This species passes through 6 naupliar stages and 5 copepodite stages before it is considered mature (Czaika 1982; Williamson 1991; Souissi and Ban 2001). See Czaika (1982) for a key to naupliar stages. Native Range: Eurytemora affinis is native to Ponto-Caspian region, the North American Atlantic coast including the Gulf of Mexico, the North American Pacific coast, the western European coast, and parts of Asia, generally in brackish and saltwater regions (Mills et al. 1993; Torke 2001). Table 1. States with nonindigenous occurrences, the earliest and latest observations in each state, and the tally and names of HUCs with observations†. Names and dates are hyperlinked to their relevant specimen records. The list of references for all nonindigenous occurrences of Eurytemora affinis are found here. Ecology: Eurytemora affinis can live for up to 73 days and the juvenile stage lasts around 11–37 days. Females can lay around 2–34 sexual eggs per day, which develop in 1–14 days (taking the longest at temperatures of 5ºC and developing most quickly at temperatures around 22ºC). This species carries sexual eggs until they hatch. Diapausing eggs are usually produced in the fall and then stay in the sediments, remaining viable up to 10–18 years, even in anoxic conditions. Eggs have the ability to survive passage through the digestive tracts of various fish species. Diapausing egg production is related to short day length, low temperature, and high copepod population density (Ban 1992; Flinkman et al. 1994; Katajisto 1996; Andersen and Nielsen 1997; Katajisto et al. 1998; Roman et al. 2001; Wonham et al. 2005). Population peaks are present at different times of year in different regions of the world. In the Milwaukee Harbor, it is present from July to November but absent in winter and spring, while in the northern Baltic Sea it is known to overwinter at low population density. In the Atchafalaya River system in Louisiana it occurs at its highest abundance in early summer, while in two European estuaries, the Gironde and the Westerschelde, it is dominant in winter and spring. In a Scottish estuary, the Forth, it is dominant in winter and summer (Roddie et al. 1984; Tackx et al. 1995; Davidson et al. 1998; Katajisto et al. 1998; Torke 2001). Eurytemora affinis is epibenthic, inhabiting both the sediments and the water column in Lake Michigan, where it is often particularly abundant in the first 10 m of water. In this lake, abundance in the water column is significantly higher in the day than at night in June, and then evens out later in the summer. In Lake Michigan, the presence of E. affinis in sediments increases in late summer. It spends winter and spring as eggs (Wells 1970; Nalepa and Quigley 1985). Eurytemora affinis can tolerate salinities of 0–40‰. In Chesapeake Bay, it is most abundant in waters of 5–10ºC and salinities of 3–8‰ but can tolerate higher salinities at lower temperatures. High salinities at high temperatures are stressful. Experiments indicate that optimum temperature and salinity ranges for this species are 10–15ºC and 5–15‰ respectively. Interestingly, one Japanese experiment showed that individuals introduced to freshwater from a brackish water source are still best adapted to salinities of 5–15‰, and that eggs from this population hatch well at salinities of 0–20‰. Eurytemora affinis can tolerate high turbidity, although production may decrease due to low food availability from lack of light and difficulty in selecting edible particles. In some European estuaries, this species is considered limited by high turbidity and anoxia (Sautour and Castel 1995; Burdloff et al. 2000; Kimmel and Bradley 2001; Roman et al. 2001; Seuront 2006). Eurytemora affinis grazes on algae, bacteria, organic detritus and protozoans, including ciliates and dinoflagellates. It can increase feeding on heterotrophic plankton rather than autotrophic plankton when suspended particulate matter increases in concentration. Feeding on microplankton ciliates is most efficient due to better perception, handling, and relative nutritional quality of these larger food particles in comparison to phytoplankton (Gasparini and Castel 1997; Merrell and Stoecker 1998; Torke 2001; David et al. 2006). Means of Introduction: Llikely introduced in ballast water from the Atlantic Coast or from western European ports in ships arriving in the Great Lakes basin. It does have a diapause stage that can be found in aquatic sediments, but it is most ubiquitous in ballast water samples (Mills et al. 1993; Wonham et al. 2005). Possibly introduced with fish stocking. Status: Considered established in all the Great Lakes with high populations. Established inland. B) Potential: Experiments in mesocosms indicate that E. affinis has the potential to control some populations of protozoan ciliates when these prey items are found at high densities (Merrell and Stoecker 1998). Eurytemora affinis is a probable host and vector for plerocercoids that can infect striped bass in the Sacramento-San Joaquin Estuary (Arnold and Yue 1997). Remarks: Eurytemora affinis is considered to be a species complex. Over the past 200 years or so, it has had a history of repeatedly invading freshwater systems from adjacent brackish or marine water bodies in many different regions of the world. In such situations, E. affinis can undergo relatively rapid evolution, exhibiting heritable shifts in tolerance and performance with respect to survival in freshwater habitats. Different populations can become reproductively isolated and incompatible. This species has also probably evolved a certain amount of tolerance to toxins of some cyanobacteria in the Baltic Sea (Lee 1999; Lee 2000; Lee and Petersen 2002; Kozlowsky-Suzuki et al. 2003; Lee et al. 2003). Euryhaline species, found in estuaries, saltmarshes, brackish waters and freshwater lakes, ponds and reservoirs. Planktonic or epibenthic grazer, feeding on plankton and organic detritus; females can produce multiple clutches of eggs; overwinters as eggs, juveniles and adult stages found between April and January. Frequently exhibits both vertical and horizontal migrations. Vertical migrations may occur in response to fluctuations in salinity, over day-night cycles, and over tidal cycles. They often occur more frequently in lakes than swamps or channels. Horizontal migrations between nearshore and open water areas may occur over day-night cycles and migrations from one habitat type to another may occur in response to oxygen regimes. In tidal areas, E. affinis is most active during the flood of spring tides and the ebb of neap tides (Hough and Naylor 1992; Morgan et al. 1997; Appeltans et al. 2003; Kelso et al. 2003; Jack et al. 2006; Seuront 2006). Andersen, C.M., and T.G. Nielsen. 1997. Hatching rate of the egg-carrying estuarine copepod Eurytemora affinis. Marine Ecology Progress Series 160: 283-289. Appeltans, W., A. Hannouti, S. Van Damme, K. Soetaert, R. Vanthomme, and M. Tackx. 2003. Zooplankton in the Schelde estuary (Belgium/The Netherlands). The distribution of Eurytemora affinis: the effect of oxygen? Journal of Plankton Research 25(11): 1441-1445. Arnold, J.D., and H.S. Yue. 1997. Prevalence, relative abundance, and mean intensity of plerocercoids of Proteocephalus sp. in young striped bass in the Sacramento-San Joaquin estuary. California Fish and Game 83(3): 105-117. Ban, S. 1992. Effects of photoperiod, temperature, and population density on induction of diapause egg production in Eurytemora affinis (Copepoda: Calanoida) in Lake Ohnuma, Hokkaido, Japan. Journal of Crustacean Biology 12(3): 361-367. Burdloff, D., S. Gasparini, B. Sautour, H. Etcheber, and J. Castel. 2000. Is the copepod egg production in a highly turbid estuary (the Gironde, France) a function of the biochemical composition of seston? Aquatic Ecology 34(2): 165-175. Colwell, R.R. 2004. Infectious disease and environement: cholera as a paradigm for waterborne disease. International Microbiology 7: 285-289. Czaika, S.C. 1982. Identification of nauplii N1-N6 and copepodids CI-CVI of the Great Lakes calanoid and cyclopoid copepods (Calanoida, Cyclopoida, Copepoida). Journal of Great Lakes Research 8(3): 439-469. David, V., B. Sautour, R. Galois, and P. Chardy. 2006. The paradox high zooplankton biomass-low vegetal particulate organic matter in high turbidity zones: what way for energy transfer? Journal of Experimental Marine Biology and Ecology 333(2): 202-218. Davidson, N.L. Jr., W.E. Kelso, and D.A. Rutherford. 1998. Relationships between environmental variables and the abundance of cladocerans and copepods in the Atchafalaya River basin. Hydrobiologia 379(1-3): 175-181. Engel, R.A. 1962. Eurytemora affinis, a calanoid copepod new to Lake Erie. Ohio Journal of Science 62: 252. Engstrom, J., M. Koski, M. Viitasalo, M. Reinikainen, S. Repka, and K. Sivonen. 2000. Feeding interactions of the copepods Eurytemora affinis and Acartia bifilosa with the cyanobacteria Nodularia sp. Journal of Planton Research 22(7): 1403-1409. Faber, D.J., and E.G. Jermolajev. 1966. A new copepod genus in the plankton of the Great Lakes. Limnology and Oceanography 11(2): 301-303. Feike, M., and R. Heerkloss. 2009. Does Eurytemora affinis (Copepoda) control the population growth of Keratella cochlearis (Rotifera) in the brackish water Darss-Zingst Lagoon (souther Baltic Sea)? Journal of Plankton Research 31(5): 571-576. Flinkman, J., I. Vuorinen, and M. Christiansen. 1994. Calanoid copepod eggs survive passage through fish digestive tracts. ICES Journal of Marine Science 51(1): 127-129. Gasparini, S., and J. Castel. 1997. Autotrophic and heterotrophic nanoplankton in the diet of the estuarine copepods Eurytemora affinis and Acartia bifilosa. Journal of Plankton Research 19(7): 877-890. Hall Jr., L.W., M.C. Ziegenfuss, R.D. Anderson, and B.L. Lewis. 1995. The effect of salinity on the acute toxicity of total and free cadmium to a Chesapeake Bay copepod and fish. Marine Pollution Bulletin 30(6):376-384. Hough, A.R., and E. Naylor. 1992. Endogenous rhythms of circatidal swimming activity in the estuarine copepod Eurytemora affinis (Poppe). Journal of Experimental Marine Biology and Ecology 161(1): 27-32. Jack, J.D., W. Fang, and J.H. Thorp. 2006. Vertical, lateral and longitudinal movement of zooplankton in a large river. Freshwater Biology 51(9): 1646-1654. Karjalainen, M., J. Pääkkönen, H. Peltonen, V. Sipiä, T. Valtonen, and M. Viitasalo. 2008. Nodularin concentrations in Baltic Sea zooplankton and fish during a cyanobacterial bloom. Marine Biology 155(5):483-491. Katajisto, T. 1996. Copepod eggs survive a decade in the sediments of the Baltic Sea. Hydrobiologia 320: 153-159. Katajisto, T., M. Vitasalo, and M. Koski. 1998. Seasonal occurrence and hatching of calanoid eggs in sediments of the northern Baltic Sea. Marine Ecology Progress Series 163: 133-143. Kelso, W.E., D.A. Rutherford, and N.L. Davidson, Jr. 2003. Diel vertical migration of cladocerans and copepods in the Atchafalaya River basin floodplain. Journal of Freshwater Ecology 18(2): 259-268. Kimmel, D.G., and B.P. Bradley. 2001. Specific protein responses in the calanoid copepod Eurytemora affinis (Poppe, 1880) to salinity and temperature variation. Journal of Experimental Marine Biology and Ecology 266(2): 135-149. Kozlowsky-Suzuki, B., M. Karjalainen, M. Lehtiniemi, J. Engstroem-Oest, and P. Carlsson. 2003. Feeding, reproduction and toxin accumulation by the copepods Acartia bifilosa and Eurytemora affinis in the presence of the toxic cyanobacterium Nodularia spumigena. Marine Ecology Progress Series 249: 237-249. Lee, C.E. 1999. Rapid and repeated invasions of fresh water by the copepod Eurytemora affinis. Evolution 53(5): 1423-1434. Lee, C.E. 2000. Global phylogeography of a cryptic copepod species complex and reproductive isolation between genetically proximate “populations”. Evolution 54(6): 2014-2027. Lee, C.E., and B.W. Frost. 2002. Morphological stasis in the Eurytemora affinis species complex (Copepoda: Temoridae). Hydrobiologia 480: 111-128. Lee, C.E., J.L. Remfert, and G.W. Gelembiuk. 2003. Evolution of physiological tolerance and performance during freshwater invasions. Integrative and Comparative Biology 43(3): 439-449. Lee, C.E., J.L. Remfert, and Y. Chang. 2007. Response to selection and evolvability of invasive species. Genetica 129(2):179-192. Lehtiniemi, M., J. Engström-Öst, M. Karjalainen, B. Kozlowsky-Suzuki, and M. Viitasalo. 2002. Fate of cyanobacterial toxins in the pelagic food web: transfer to copepods or to faecal pellets? Marine Ecology Progress Series 241:13-21. Lindley, J.A., P. Donkin, S.V. Evans, C.L. George, and K.F. Uil. 1999. Effects of two organochlorine compounds on hatching and viability of calanoid copepod eggs. Journal of Experimental Marine Biology and Ecology 242(1):59-74. Maes, J., M. Tackx, and K. Soetaert. 2005. The predation impact of juvenile herring Clupea harengus and sprat Sprattus sprattus on estuarine zooplankton. Hydrobiologia 540(1-3):225-235. Merrell, J.R., and D.K. Stoecker. 1998. Differential grazing on protozoan microplankton by developmental stages of the calanoid copepod Eurytemora affinis Poppe. Journal of Plankton Research 20(2): 289-304. Morgan, C.A., J.R. Cordell, and C.A. Simenstad. 1997. Sink or swim? Copepod population maintenance in the Columbia River estuarine turbidity-maxima region. Marine Biology 129(2): 309-317. Nalepa, T.F., and M.A. Quigley. 1985. Distribution of epibenthic microcrustaceans in nearshore Lake Michigan. Freshwater Invertebrate Biology 4(2): 53-63. Piasecki, W., A.E. Goodwin, J.C. Eiras, and B.F. Nowak. 2004. Importance of copepod in freshwater aquaculture. Zoological Studies 43(2):193-205. Roddie, B.D., R.J.G. Leakey, and A.J. Berry. 1984. Salinity-temperature tolerance and osmoregulation in Eurytemora affinis (Poppe) (Copepoda: Calanoida) in relation to its distribution in the zooplankton of the upper reaches of the Forth Estuary. Journal of Experimental Marine Biology and Ecology 77(2): 191-211. Roman, M.R., D.V. Holliday, and L.P. Sanford. 2001. Temporal and spatial patterns of zooplankton in the Chesapeake Bay turbidity maximum. Marine Ecology Progress Series 213: 15-227. Sautour, B., and J. Castel. 1995. Comparative spring distribution of zooplankton in three macrotidal European estuaries. Hydrobiologia 311(1-3): 139-151. Savitz, J.D. and D.A. Wright. 1994. Toxic effects of the insecticide diflubenzuron (Dimilin®) on survival and development of nauplii of the estuarine copepod, Eurytemora affinis. Marine Environmental Research 37(3):297-312. Setälä, O, S. Sopanen, R. Autio, and K. Erler. 2009. Grazing and food selection of the calanoid copepods Eurytemora affinis and Acartia bifilosa feeding on plankton assemblages containing Dinophysis spp. Boreal Environment Research 14:837-849. Seuront, L. 2006. Effect of salinity on the swimming behaviour of the estuarine calanoid copepod Eurytemora affinis. Journal of Plankton Research 28(9): 805-813. Souissi, S., and S. Ban. 2001. The consequences of individual variability in moulting probability and the aggregation of stages for modeling copepod population dynamics. Journal of Plankton Research 23(11): 1279-1296. Sullivan, B.K., E. Buskey, D.C. Miller, and P.J. Ritacco. 1983. Effects of copper and cadmium on growth, swimming, and predator avoidance in Eurytemora affinis (Copepoda). Marine Biology 77(3):299-306. Tackx, M., X. Irgoien, N. Daro, J. Castel, L. Zhu, X. Zhang, and J. Nijs. 1995. Copepod feeding in the Westerschelde and the Gironde. Hydrobiologia 311(1-3): 71-83. Thorp, J.H., and A.F. Casper. 2003. Importance of biotic interaction in large rivers: an experiment with planktivorous fish, dreissenid mussels and zooplankton in the St. Lawrence River. River Research and Applications 19:265-279. Torke, B. 2001. The distribution of calanoid copepods in the plankton of Wisconsin Lakes. Hydrobiologia 453/454: 351-365. Wells, L. 1970. Effects of alewife predation on zooplankton populations in Lake Michigan. Limnology and Oceanography 15(4): 556-565. Williamson, C.E. 1991. Copepoda. Pp. 787-822 in J. H. Thorp and A. P. Covich, eds. Ecology and Classification of North American Freshwater Invertebrates. Academic Press, Inc., San Diego, California. 911 pp. Wonham, M.J., S.A. Bailey, H.J. MacIsaac, and M.A. Lewis. 2005. Modelling the invasion risk of diapausing organisms transported in ballast sediments. Canadian Journal of Fisheries and Aquatic Sciences 62: 2386-2398.